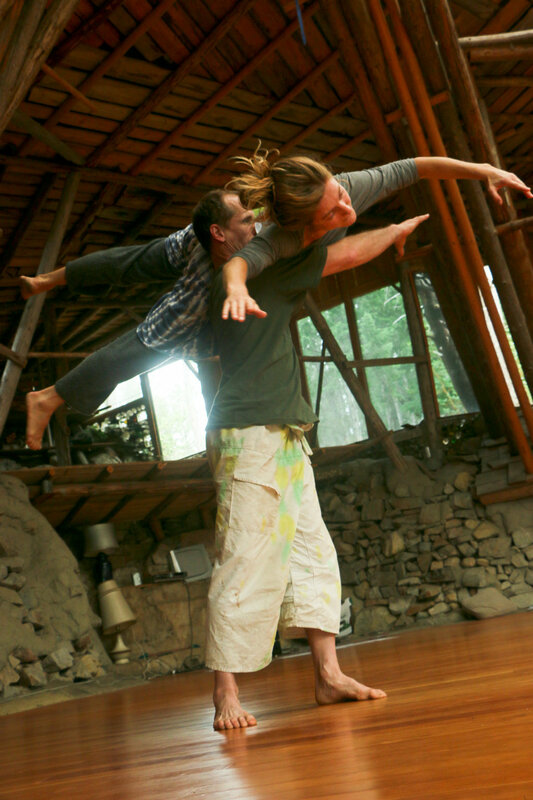 Foundations to Contact Improv, 12day workshop, Sept10-23,2017. Arrive Sunday Sept10 for orientation. First class is Monday 11th at 10am. We end after breakfast on Saturday, Sept23. $1000Canadian includes tuition, dormitory, camping, all meals, transportation on Lasqueti Island and taxes. This 12 day workshop is co-taught by Mark Young and Olivia Shaffer. Olivia’s approach to Contact Improvisation (CI) is rooted in cultivating an awareness of our body’s physical sensations and an embodied tuning to the present moment. Classes will incorporate solo movement investigations and hands-on partner work. 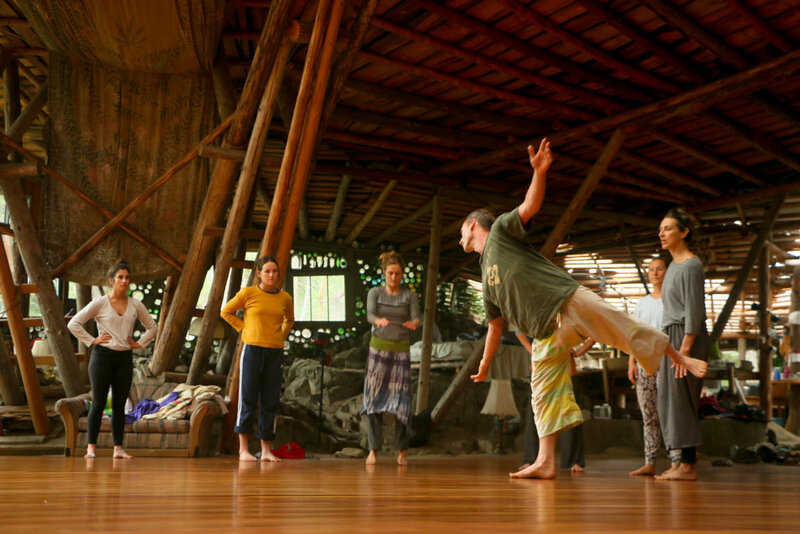 Principles such as yielding, head-tail connection, and push patterns will be explored to enrich our dancing in contact with others. These explorations will help us integrate the interconnections of our limbs and notice unnecessary tension in our bodies. We will examine pathways that allow us to move in and out of the floor with ease and efficiency. 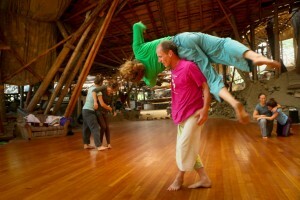 As we begin to dance together we will discover the innate physics in our movements. Gravity can become a tool rather than a hindrance. By learning to gently pour the weight of our body into others, we will notice how timing can allow for effortless movements. Similarly, we will explore how we can make ourselves light and supportive in surrendering to weight flow and counterbalance. Olivia’s classes offer an opportunity to develop CI techniques that will both foster the dancing of beginners and satisfy the hunger of more advanced practitioners. Olivia Shaffer is an independent performer, improviser, choreographer and teacher from Vancouver, BC. She holds a BFA and a Liberal Arts Certificate from the School for Contemporary Arts at Simon Fraser University. She works as a freelance dance artist with several Vancouver-based companies such as EDAM Dance, Co.ERASGA, MACHiNENOiSY and Raven Spirit Dance, among others. Since 2011, Olivia has had the pleasure and privilege of developing her skills under the guidance of two mentors: CI master Peter Bingham and somatic movement expert Helen Walkley. Olivia trains daily with Peter and his renown dance company EDAM, and has an ongoing rapport with Helen as a devoted student and artistic collaborator. Mark’s classes will begin with Tai Chi foundation exercises as taught by Master Moy Lin-Shin. These exercises are to get us moving spirally while shifting weight in a fluid manner. We will connect Tai Chi exercises to Spiral Rolls and then show how spiraling while dancing conserves energy, provides a more stable base, increases tone and provides more clear communication with our partner. ‘From the Ground Up’ – Cultivating awareness of our own sensations by feeling the floor, feeling the alignment of our bones as we stand, feeling the difference between tension and relaxation. We will focus on the physical sensations that arise in proximity to another as we weave in and out of each-others personal space. What effect does physical intimacy have on my sensations? Coming into contact gives us a different set of sensations, not only our own but we can now feel another persons tensions and relaxation. This linking through a single point of contact is where we find our impetus for movement, by tuning into our own genuine sensations we feel the effect another has on us. As the week progresses we will practise lifts and pathways off of the floor with partners. Aerials should happen spontaneously in an improvised dance. However, it is nice to know that a pathway exists without going into fear and stopping the flow. We will practise these pathways in a slow, supported way. In exploring the concept ‘tension masks sensation,’ there will be three meditation times per day to reduce tension. Meditation is is not being taught or guided and is not part of the class time. It is not compulsory to meditate but it is asked that participants commit to being contemplative and remain in a quiet solitude during the meditation times. One may choose to sleep or walk to the beach. Conversation and caffeine are discouraged during these three times throughout the day. The intention is to reduce tension in the body, hence cultivating a greater awareness of genuine sensation. Reflexes become faster, reactions become more appropriate, measured and connected. Although suitable to new people and beginners, it is recommended that you be fit and willing to work through the discomfort of Spiral Rolls, Crescent Rolls and Aikido Rolls. This work and the partnering exercises we will use are accessible to all, you do not have to be an athlete or professional dancer. There will be higher level participants and for those willing to explore lifts and flying. Mark Young has been doing Contact Improvisation since 1997. What began as fun re-hab after a traumatic accident quickly became a serious study. He also began a serious study of Tai Chi and Vipassana meditation around the same time, these are the foundations of Contact Improvisation. He has studied C.I. with Nancy Stark Smith, Ray Chung, Karen Nelson, John Faichney, Alicia Grayson, and attended numerous conferences with the originators of the form at Breitenbush Hot Springs retreat centre. 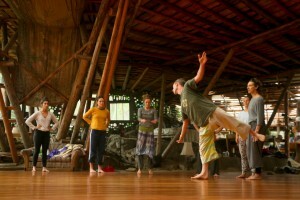 Also, he has attended numerous Contact Improv jams at Earthdance retreat centre in Massachusetts over the past 15 years. In 2000 he committed all of his resources to the creation of Leviathan Studio, a dance studio committed to the study of Contact Improvisation. $1000Canadian, go to ‘Contact Us’ on the right side of this page to register. Send a message with ‘September’ in the subject line.